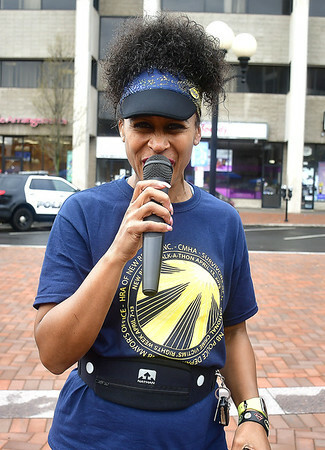 NEW BRITAIN - On a drizzling Saturday morning, over 50 people walked through the streets downtown to show support for National Crime Victims’ Rights Week. The awareness walk, attended by city officials, community leaders, supporters and victims themselves, concluded the week, which was meant to showcase the services available to crime victims. 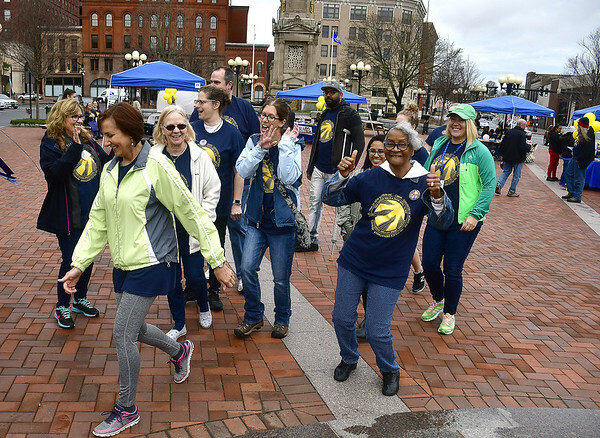 “Even though the weather is not the greatest, there is a great turnout,” said Marlo Greponne, director of planning and programs at the Human Resources Agency of New Britain. That shows that people care, she said. “We are excited with how many people showed up this morning to promote the services we have for victims of crimes,” said Mayor Erin Stewart. Stewart was at the front of the line of walkers, waving a crime victim awareness flag. “We are proud to form these community partnerships,” she added. HRA, the city, the New Britain Police Department and Community Mental Health Affiliates worked together on the week of awareness, which began with a press conference on Monday. “This right here is great to have because it brings the community together and shows victims that we have their backs,” said Alderman Francisco Santiago. He pointed out that there were people of a variety of backgrounds walking, showing that support for victims of crimes knows no boundaries. “It’s critically important to raise awareness for services for victims of crimes,” said Greponne, who shared words of encouragement with walkers. Greponne mentioned that it’s often difficult for victims to come forward, and emphasized that the community provides various services to make it easier. 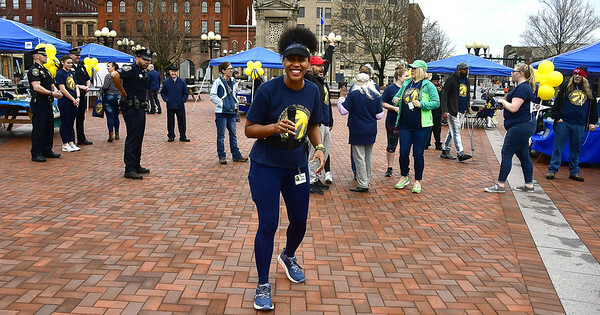 Wearing T-shirts reading “National Crime Victims’ Rights Week” and waving flags, supporters completed their 1.5-mile loop through the city. “It’s a great way for the community to get together and support victims of crimes,” said Police Chief Christopher Chute. “We need to create an environment to make people comfortable coming forward,” he added. That especially applies to police, Chute said, because they are the first to be in contact with victims of crimes. Some walkers were victims themselves. “It’s (the walk) for a good cause because there’s a lot of crime,” said Sandy Lada. Lada said that she was a victim of crime herself. An abusive boyfriend beat her, causing her to move out and become homeless. She turned to the Friendship Center in New Britain so she could have a warm place to sleep. “I got away alive,” she said. But others aren’t so lucky, she added. Awareness walks help people know that there’s services out there that can help, Lada said. 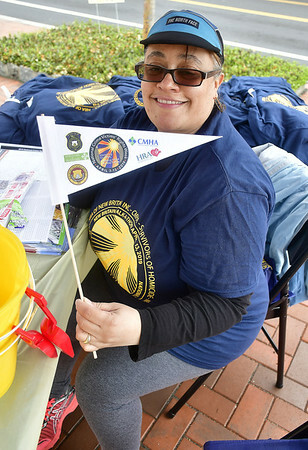 In Central Park, various resource tents shared information about their services with attendees. 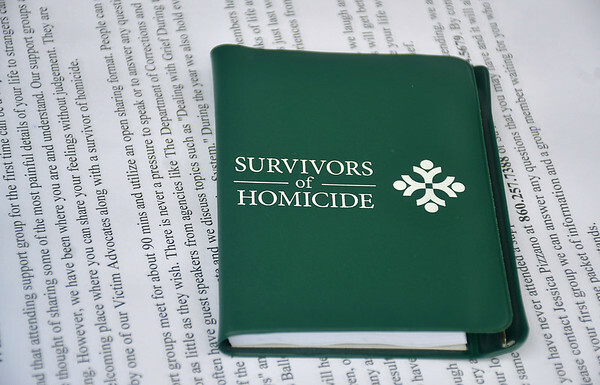 “We’re a nonprofit organization and we offer support, counseling, advocacy and court support to families of homicide victims,” said Jessica Pizzano, director of victim services for Survivors of Homicide. The nonprofit is based out of Wethersfield but helps people across the state. “We go where we’re needed,” said Pizzano. “It (The walk) raises awareness of the services out there and that there are victims who need help,” said Kelly Neumann, a clinician for Community Connections for Survivors, part of CMHA. She added that their services are community-based and that no insurance is needed. They provide individual therapy, group therapy and advocacy. “We’re here to provide awareness. You can never judge a book by its cover. You never know what someone’s going through, or what they have gone through in their past,” said Helen Supsinskas, the Polish victim advocate for HRA. “We take someone’s past and brighten their future,” she added. HRA helps victims of crimes and other people in need with everything from dealing with elder abuse to energy assistance to employment services to offering groceries through a food pantry. “A lot of times our clients aren’t taken seriously or there’s a language barrier,” Supsinskas said. That’s where she comes in. She knows the Polish language and culture. She helps victims with finding health services, navigating the medical system, sorting out immigration issues and more. There is help out there, Supsinskas and the other employees of HRA emphasized. Around 90 other communities participated in the National Crime Victims’ Rights Week across the country, said Greponne. “In the end, I think it’s serving its purpose because people are out having that moment of togetherness,” Greponne said. Posted in New Britain Herald, New Britain on Sunday, 14 April 2019 21:46. Updated: Sunday, 14 April 2019 21:48.